Blepharospasm is the involuntary closing of the eyelid or excessive involuntary blinking. The first symptoms of blepharospasm may be an occasional increase in blinking in one or both eyes or simply difficulty in keeping the eyes open. Most patients with blepharospasm also present light sensitivity and dryness of the eyes. If the illness progresses, the eyelid spasms start to become more frequent until they become constant. This illness is normally progressive as the spasms usually become more frequent and the periods of relaxation between them shorter. However, in some cases the spasms reach a plateau and remain at this level without progressing. The symptoms usually start in the fifth and sixth decade of life and are three times more frequent in women. Although benign essential blepharospasm (BEB) was first described in a US medical journal in 1985, it has only been in the last few years that doctors have started to recognise it as a physical and not a psychological disorder. There is no specific test for this as it is a clinical diagnosis. Initially, it's common for patients to think their problem is merely a bad habit and they don't seek medical advice. Spasms can become more frequent and last longer so that patients become functionally blind. If intense, the facial spasms can interfere with talking or eating. Patients can have great difficulty in driving, reading, watching television or carrying out any other activity in their daily lives. What is apraxia of eyelid opening? Apraxia of eyelid opening associated with blepharospasm is the most frequent cause of the failure or little benefit from treatment with botulinum toxin. Patients presenting this find it difficult to open their eyelids even after the eyelid spasms have been reduced with botulinum toxin. In these cases patients need a period of time after the spasm to be able to open their eyelids. Treatment with botulinum toxin injections is currently the treatment of choice for blepharospasm. 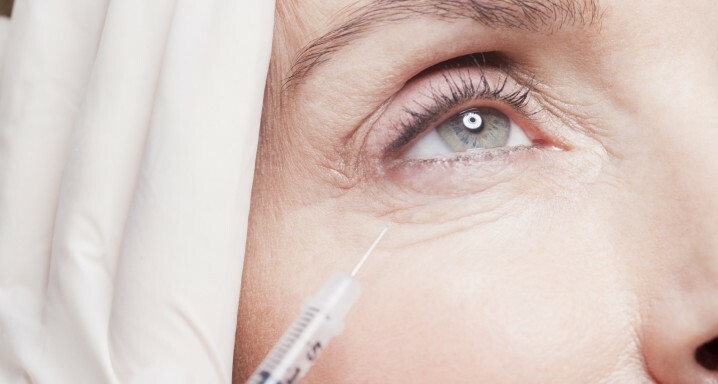 Small amounts of botulinum toxin are injected into the muscles around the eyes. These injections temporarily weaken the muscles, thereby reducing or eliminating the spasms. The effect of these injections is always temporary and normally lasts around three months, so it must be repeated to maintain the effect. Surgical treatment (myectomy) is reserved for patients who do not respond to treatment with botulinum toxin. This consists of the partial or total removal of the muscles responsible for closing the eyes, principally the orbicularis oculi muscle. In some cases it is also necessary to continue with botulinum toxin injections after surgery. Botulinum toxin is not effective in treating apraxia of eyelid opening. In a small percentage of patients whose apraxia is highly debilitating, surgery may be required such as frontalis suspension, which helps to open the eyelids.